Hello, Crafty Friends!! !Welcome to the Die-Namites/ So Suzy Stamps DesignTeam Blog Hop!! We are ecstatic that you're here!! Please hop along today and tomorrow (2/19 - 2/20), as we share with you our projects that incorporate beautiful dies with awesome high quality stamps. Each day we'll have new projects featuring talented artist from 2 amazing design teams! We also have some awesome blog hop candy to give away!! Each design team will be giving away a $25 gift certificate to their team's website. One random winner will be chosen for each prize. Chances of winning depends on amount of qualified entries. 2. FOLLOW each BLOG & leave a COMMENT on the BLOG HOP post. 3. LIKE Die-Namites Dies & So Suzy Stamps on Facebook. If you are just joining us you may want to start at the beginning of the hop, HERE. If you are coming from Monica Monge-Taylor's blog, Taylormade Cards 4u, you are in the right place!! Welcome!! We hope you're having a great time so far and I am so happy that you stopped by! 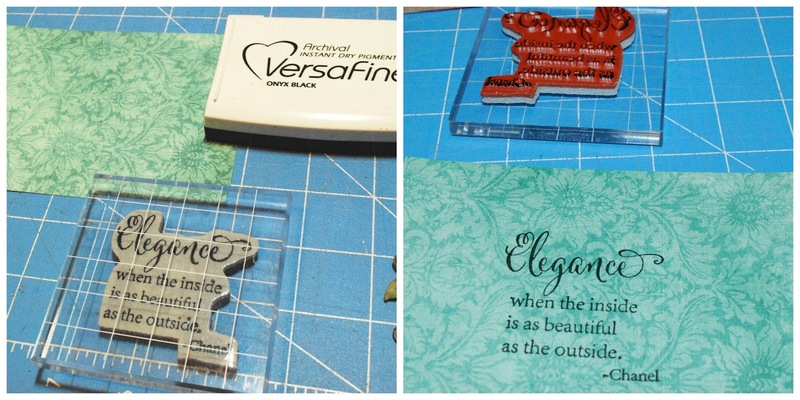 For today's project I chose to use the following Die-Namites Dies and So So Suzy Stamps. 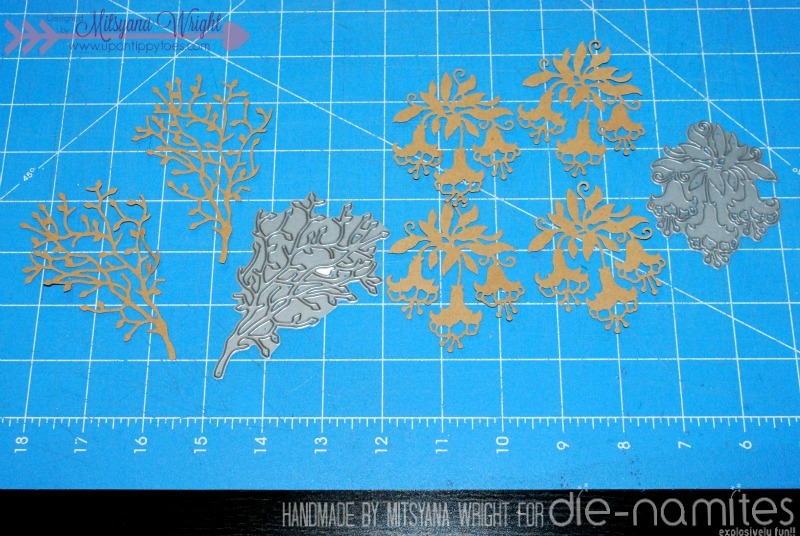 I started by die-cutting the Bell Flowers and Budding Branches out of craft paper. I cut 4 Bell Flowers and 2 Budding Branches. I colored and shaded all my flowers with my eBrush machine and Sharpie markers. For the leaves I used a the following colors: light green, green, and orange. 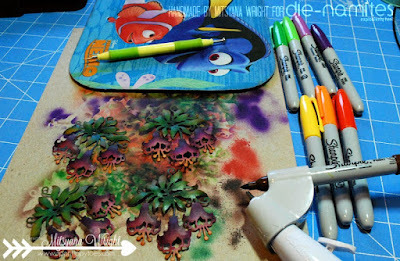 For the bells I used lavender, purple, and brown... for the stamens on the flowers I used yellow and orange. After airbrushing them I added a bit of dimension using a stylus and foam mat by rubbing my stylus in a circular motion on the back side of my flowers. I hand drew detail lines using a PITT Artist Pen in XS. And, for the budding vines, I used a white opaque marker just on the buds. I stamped the Elegance sentiment stamp by So Suzy Stamps using VersaFine Onyx Black ink pad. The red rubber stamp gives a gorgeous crisp image! Just look at those details... these are really fine lines and the impressions are clean and crisp! 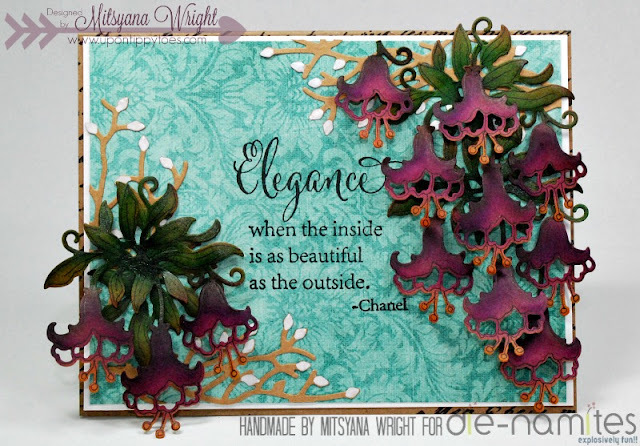 I snipped my budding branches and bell flowers into smaller pieces and attached them onto my card front using glossy accents. 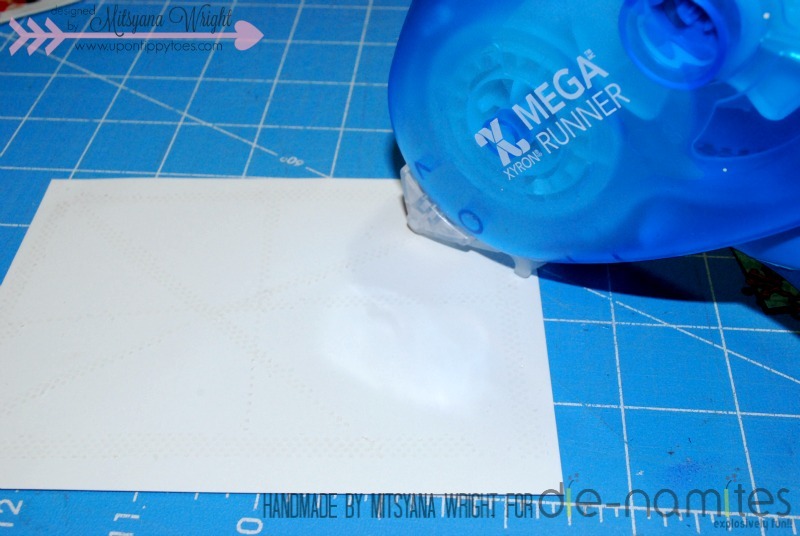 Then, lastly, I used my Xyron Mega Runner to attach my card front to my card base. I could have attached the card front before adding my die-cut but got carried away and attached them to my card front first. LOL... sometimes it happens! I hope you enjoyed my project for today!! Don't forget to keep on hopping and visit these other wonderfully talented ladies!! And, don't forget to come back again tomorrow for day 2 of our awesome blog hop!! HAVE A SUPER CRAFTY DAY!! Thank you so much, Maaike Uijthoven! Your layering of those beautiful dies is breathtaking. A stunning and gorgeous project. Loving the colouring in of those flower and dies. Thank you so much for the inspiration. Than you so very much!! That is very sweet of you, Mac Mable! Dear Mitsy, another wonderful tutorial with a stunning creation. Thank you my friends for stay with me always! I love your creations and you made a perfect combination. I am your most special fan!!! A big hug!!! WOW!!!! Those Bell Flowers are STUNNING!!! They look so real! Stunning card! Thank you, Suzy!! And your stamps were just a perfect match!! LOVE THEM!! Sharpies?!? You made that with SHARPIES?!? I'm dying. I have no words. It's breathtaking! YES!! SHARPIES!!! I know right!! I love my SHARPIES!! And thank you for the wonderful compliment!! so petty, love it!! and yes you flowers you did are awesome!! This is stunning! I'm really loving those flowers! Thank you so much, Mary Nelson! Great inked word! So beautiful! Those lovely flowers and that sentiment are fabulous together! Thank you so much, D.Ann!! stunning card! the color in that flowers are great!!! Very beautiful card, great ink work. Thank you so much, ionabunny!! The layering of the flowers is great. that is put on display for everyone to enjoy. Awww, you're so sweet! Thank you, Mary!! Wow what a beautiful card. The sentiment is perfect for your flowers! Thank you, Doreen... I love that die also... it has become one of my favorites! Great card Mitsy! Love the coloring on the flowers. I have never seen these techniques- stunning! Glad I was able to show you something new! I love this card! Amazing details. Fabulous colors! Love the bell flowers die! Beautiful card! Thank you, Denise! I love this die!! Such gorgeous colors on that die and the sentiment is so beautiful too. 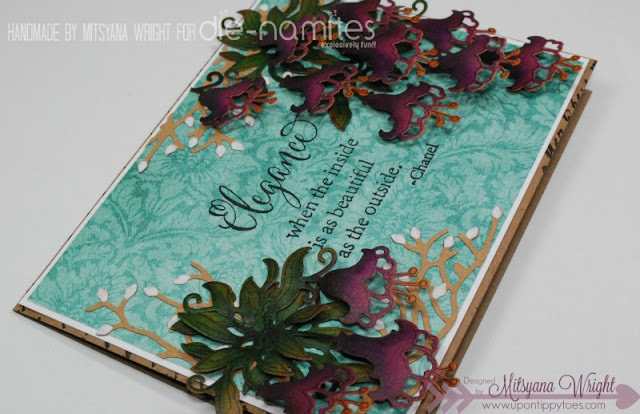 All together with the beautiful background paper you created a fantastic card. Thank you, Verna!! That is such a great compliment!! Excellent card. I love how you colored and layered the die cuts. Well done. 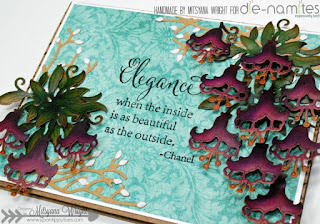 Very beautiful card ))))Thanks for this Blog Hop. What a stunning card. Love the colour combination. Love what you did with those bell flowers. Striking color combination. Brilliant card! The colours are just gorgeous! I would love to see bigger photos!